The words pig, hog and swine are all generic terms without regard to gender, size or breed. Pigs originated from Eurasian Wild boars. A pig is any of the animals in the genus Sus, within the Suidae family of even-toed ungulates. Pigs include the domestic pig, its ancestor the wild boar, and several other wild relatives. The domestic pig (Sus scrofa domesticus) is usually given the scientific name Sus scrofa, although some authors call it S. domesticus, reserving S. scrofa for the wild boar. It was domesticated approximately 5,000 to 7,000 years ago. Their coats are coarse and bristly. Their head and body length ranges from 0.9 to 1.8 m and they can weigh between 50 and 350 kg. Pigs are very intelligent and learn quickly. They pick up tricks faster than dogs. Pigs rank number 4 in animal intelligence behind chimpanzees, dolphins and elephants. Piglets learn their names by two to three weeks of age and respond when called. Pigs are highly prolific. 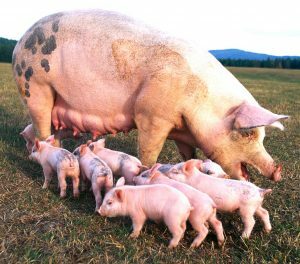 A sow can give birth to a litter containing 7 to 18 piglets, about 2 – 3 times a year. The gestation period of a sow is 114 – 115 days (3 months, 3 weeks and 3 days). A piglet (baby pig), weighs about 1.5 kilograms at birth and will double its weight in just 7 days. Weaning occurs at two months of age or less. Pigs are much more tolerant of cold than heat. Pigs have no sweat glands, so they can’t sweat. They roll around in the mud to cool their skin. The layer of dried mud protects their skin from the sun. If available, pigs, who are great swimmers, prefer water to mud. Some pigs have straight while some have curly tails. Pigs have four toes on each hoof, but only walk on two toes per foot.